This is the final installment in my Getting Recruitment Ready series! I know it took me forever to get through it, but the end is here. Preference round is by far the most formal round of recruitment. When you're picking out what to wear, think business wear or for a cocktail party. Classy and sophisticated. I know a lot of people will gravitate to the classic LBD, but I would advise against that for preference round. Sororities tend to have their sisters wear black or white for pref so wear a color to make sure you stand out from the crowd. This is the last chance to really make the sororities remember you. When I was getting ready for recruitment, I picked out two dresses from J. Crew Factory for preference (our preference was over two days, something to keep in mind when shopping), and personally I think J. Crew does business attire better than just about anywhere. Also try to pick out something you will wear again. I ended up wearing one of the dresses I got for preference for my semi formal and for my family's Christmas Eve celebration. If your dress is more basic, dress them up with fun, sparkly statement necklaces. I've probably said that for every round, but I think statement necklaces can be the perfect addition to any outfit. Comfortable pumps are a necessity for long rounds and these Madden Girl ones are great (they're the ones I got for recruitment and have worn a ton since). Also keep in mind (for every other round too) that these are long days and it's going to be hot. Pick something where you don't have to worry about possible undergarment mishaps. You don't want to be constantly making sure your dress isn't falling down when you're trying to talk to sisters. Moving on from outfits, preference is the most serious and longest round. At Clemson, I think we were there for 45 minutes to an hour, maybe more. I know your head will be swimming with the big decision you will be making that night, but try to focus on the sister you are talking to and her sorority. Preference round can also get pretty emotional, and don't be afraid of that! One of my friends cried during the preference round for her now sorority. That's not uncommon. If one sorority really strikes a chord with you, it might just be the right one! I wish every one the best of luck with all of recruitment and finding your sisters for a lifetime. I might have a couple more recruitment related things coming too! 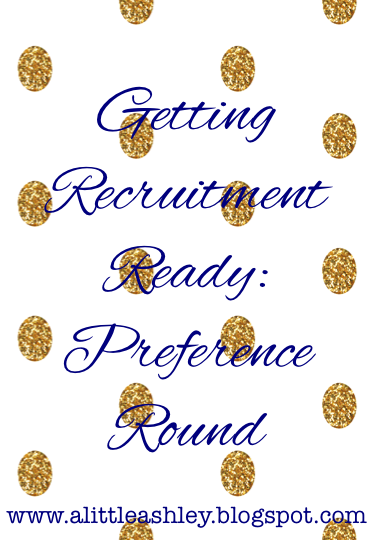 Check out my post for the first, second and third rounds of recruitment too!